Despite the increasing death toll through political self-immolation, Tibet’s numerous protests against Chinese ruling have gone largely unnoticed in the global press. Dozens of Tibetans have set themselves on fire over the past year to protest Chinese rule, sometimes drinking kerosene to make the flames explode from within, in one of the biggest waves of political self-immolations in recent history. The Tibetan protesters have burned themselves in market places, main streets, military camps and other symbols of government authority in western China, mostly in a single remote county. Most of the protesters have been members of the Buddhist clergy. The latest were two monks, aged 21 and 22, on Friday [30 March 2012]. Shocking to most people’s sensibilities, self-immolation is calculated, desperate and powerful, Biggs and other experts say. Its effects can be far-reaching, evoking sympathy in people unrelated to the cause and calling the like-minded to action. In the 6th century, the Chinese monk, Dazhi, used a red-hot iron and a knife to burn and then peel the flesh from an arm then removed the bones and set them on fire to protest limits on the Buddhist community ordered by a Sui dynasty emperor, said James Benn, author of “Burning for the Buddha,” a book about Buddhist self-immolation. Sometimes the distinction is blurry between political protest and suicide. In Afghanistan, for example, self-immolation is a common way for women to commit suicide. Many self-immolations have been reported in Tunisia since fruit seller Mohammed Bouazizi’s act, but experts say most of them were likely suicides for personal reasons, not protests. The monk was protesting the South Vietnamese government’s discrimination against Buddhists and his act touched off anti-war sentiments in America and undermined support for the U.S.-backed regime. Also, China’s emergence as the world’s second-largest economy and its growing diplomatic clout make it less likely that foreign governments throw any substantial weight for the Tibetan cause. The protests are unlikely to sway a Chinese population that has come to associate the tactic with the banned Falun Gong spiritual movement after five of its members set themselves on fire on Tiananmen Square in 2001. China used the event — in which a woman and her 12-year-old daughter died — to support its claim that Falun Gong is an “evil cult” and justify a brutal crackdown. The Chinese public, in any case, has little sympathy for Tibetan appeals. 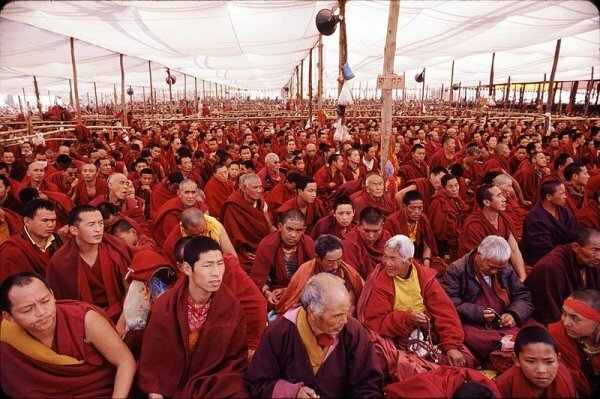 Many in the Han Chinese majority adhere to the government’s position that Tibetan protesters want to split Tibet from China. In January, a 42-year-old monk named Sopa in Qinghai province drank kerosene and threw it over his body before setting himself alight. Radio Free Asia quoted a source as saying his “body exploded in pieces” before police took it away. Residents reportedly smashed the windows and doors of a local police station to get the body back, then paraded it through the streets in protest. “Self-immolation is an extraordinarily effective psychological tactic,” said John Horgan, a terrorism expert at Pennsylvania State University who is leading a project to compile a database of self-immolations in the world. “Because self-immolation doesn’t result in the killing of innocent bystanders, it is often characterized as an extremely noble gesture, borne out of frustration and helplessness,” Horgan said. Self-immolations don’t have the same negative associations as suicide bombings, but tend to generate the same amount of publicity, Horgan said. “When there’s a really pervasive frustration and all options are used and not working, then self-immolation as a tactic or protest is taken seriously,” said Ben Park, a Pennsylvania State University expert on self-immolations in South Korea between 1971 and 1993.